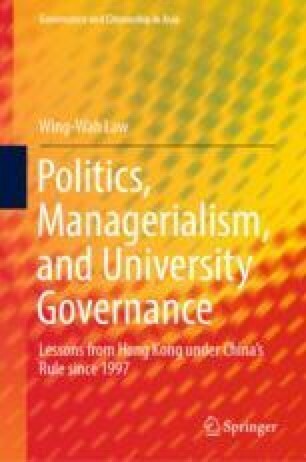 This chapter scrutinizes the first repercussion of Occupy Central on university governance in Hong Kong: a territory-wide controversy over HKU’s appointment of a liberal scholar to a senior management position. It argues that this intramural personnel issue was complicated by the pro-democracy Occupy Central, leaks of confidential information from HKU and a confidential UGC report on the research performance of its public universities, and orchestrated personal and political attacks on the sole internal candidate by pro-establishment and pro-Beijing newspapers. However, HKU council handled these external pressures poorly, using various tactics to delay its consideration for over a year before eventually rejecting the candidate. The leaked reasons for the rejection further revealed two major concerns about the managerial model of university governance: the competing interests among council members, and the dominance and political role of external council members in university governance. Cheung, T. (2015, November 10). What they said: New HKU leak reveals dispute over pro-vice chancellor choice. South China Morning Post. Retrieved from http://www.scmp.com/news/hong-kong/politics/article/1876948/what-they-said-new-hku-leak-reveals-dispute-over-pro-vice. Ching, C. (2015, September 10). Zunzhong Shishi: Gangda Xiaoyou Buben! [Respect the truth: HKU alumni are not stupid] Hong Kong Economic Journal Forum. Retrieved from http://forum.hkej.com/node/125612. Chugani, M. (2015, December 23). A matter of opinion, without the smears, on HKU Pro-vice-chancellor controversy. South China Morning Post. Retrieved from http://www.scmp.com/news/hong-kong/politics/article/1893888/matter-opinion-without-smears-hku-pro-vice-chancellor. Lai, Y., Zhao, S., & Siu, P. (2015, October 29). HKU audio leak: Johannes Chan a ‘nice guy’ but unqualified for deputy head position, says council member Arthur Li. South China Morning Post. Retrieved from http://www.scmp.com/news/hong-kong/education-community/article/1873109/hku-audio-leak-johannes-chan-nice-guy-unqualified. Ming Pao Reporter. (2015b, October 28). Wei Juankuan Fengbao Kangbia Zhiyi Wei Gongzheng [Defending for donation crisis, questioning the violation of justice]. Ming Pao [Ming Pao News]. Retrieved from http://news.mingpao.com/pns/dailynews/web_tc/article/20151028/s00002/1445968710513. National People’s Congress. (2014). Xianggang Daibaiotuan Diabiao Mingdan [List of the Hong Kong delegates to the 12th national congress, 2012–2018]. Retrieved from http://www.npc.gov.cn/delegate/dbmd.action?id=d5. Ng, J. (2015a, October 7). 2,000 HKU students and staff joined silent march to protest liberal scholar’s rejection from key post. South China Morning Post. Retrieved from http://www.scmp.com/news/hong-kong/education-community/article/1864546/hku-staff-and-students-hold-silent-march-demand. Zhao, S. (2015, July 29). HKU students rally to call for end to delay in appointment of liberal scholar to key position. South China Morning Post. Retrieved from http://www.scmp.com/news/hong-kong/education-community/article/1844319/hku-students-rally-call-end-delay-appointment.